Lemon juice will lighten the look of hair anywhere, as long as you apply it and expose yourself to direct sunlight. Squeeze a large lemon to gain about 2 tablespoons of juice, which should be mixed with a half cup of water and massaged onto the area of hair you wish to lighten. Rinse off well after a few hours and you should notice a difference instantly. Pick about a cup of chamomile flowers and drop them in a cup of boiling water. After an hour or so, strain the mixture and apply it cold to areas on your body that you wish to look lighter. Let it soak on your skin for a half hour and repeat the process about five times for noticeable results. This piece of produce is sure to lighten and brighten your body hair. Chop up fresh rhubarb (about half a cup) and add it to two cups of boiling water. Once the mixture cools, strain it and blot it on the area of hair you wish to become lighter, using a wash cloth or cotton ball. Repeat this process daily for a week to see results. This mixture has been making hair look lighter for years. You can dip a Q-tip into the solution and rub it generously on the hair to be lightened. For best results, apply each day, in the exact same spot to notice hair become lighter and less noticeable. Steep a few tea bags in boiling hot water. After the water cools, use a cotton ball to apply the tea to the targeted areas of body hair to be lightened. The natural ingredients in tea are also natural hair lighteners, so apply all over your body to lighten up! 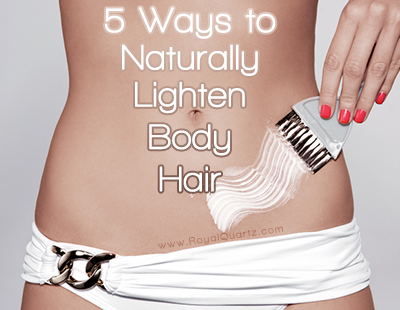 If you want to make your body hair look lighter, you can turn to nature before turning to chemicals!